Thousands of Hoosier children rely on their schools when it comes to finding their next meal. Belzer Middle School in Lawrence Township is no different, which is why they recently opened a food pantry. Lawrence, IN ( WXIN ) -- Thousands of Hoosier children rely on their schools when it comes to finding their next meal. 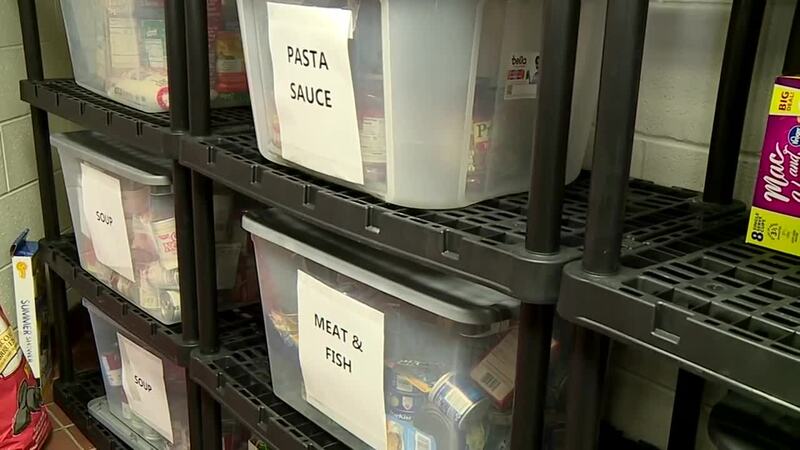 Belzer Middle School in Lawrence Township is no different, which is why they recently opened a food pantry. What sits behind a door in the back of the school could change a child’s life. “Most of the kids are very appreciative,” said Lakeitha Patterson, the Community and School Liaison for Belzer Middle School. Principal Andy Harsha said in just the first week, out of 1,200 kids, 37 kids were sent home with food. “I never realized that we had students here were in that much need and how can I help?” questioned Harsha. Kids line up each week to fill their backpacks. In a discreet way, the children meet in a hallway to grab what they need for the weekend or break ahead. At first shy, Patterson and Harsha say, the kids have opened up about the pantry. Patterson works one-on-one with them and their families. She determines what items a child needs and how the school can help. Patterson mentioned an encounter she had with a parent over the phone. “Her student was absent on Friday, so she had called and was like we didn’t get food, can I come?” she said. There’s cereal, snacks, and milk. “Could we get some more pasta or pop tarts? They’ve sort of opened up a little bit,” said Harsha when talking about how the kids interact with the pantry. Three quarters of Belzer students are on free or reduced lunches. That means of every four kids walking down the halls, three of them need assistance. And teachers are helping across the township. At Fall Creek Valley Middle School, the Paw Pantry serves approximately 27 students per week. Lawrence Central High School just started their pantry, named the LC War on Hunger Food Pantry. They serve about 10 students. Also, at Lawrence North High School, the …And Go Cats Food Pantry serves approximately 30 students per week. Belzer isn’t alone in this fight; this is a Central Indiana issue. At Indianapolis Public Schools, they partner with Gleaners Food Bank to support 26 school-based pantries, serving more than 21 thousand children. In Noblesville they’re supporting 500 students through a ‘Fuel for School’ program. Hamilton Southeastern students at all schools can donate any uneaten, pre-wrapped food from their lunches that can be re-used and served again. Food pantries in Hamilton County pick up those items from our schools and use them to serve their clients. At Southern Hancock, there’s the New Palestine Junior High Dragons Giving Closet. The junior high teams collect food items, toiletries, and other household items for families in need. Along with Stacy’s Sharing Closet that’s run by an elementary teacher. Between the two, Southern Hancock estimates they’ve helped about 40 to 50 families. Harsha says it takes a community to serve the whole student. “We know that if students are coming to school and they don’t feel safe, or they’re hungry, or whatever their immediate real needs are, we can’t expect them to learn and be creative,” said Harsha. Belzer Middle School created an Amazon Wish List, where they’re now receiving donations from out of state to their food pantry. Click here to see what items they need. “They click on a link, they chose some items, they pay with their credit card and an Amazon box shows up at our front office with Belzer food pantry on it – it just makes it so easy to give,” said Harsha.